The Lawrence Headquarters Branch of the Mercer County Library System is hosting PlayFest, its eleventh annual one-act play festival on Saturday, April 27. There will be two performances, 6:30 and 8:30 pm. Tickets are free, but seating is limited. Registration is required online starting at 9:30 am on Monday, April 8, 2019. This free festival provides an entertaining evening for the audience and a venue for local playwrights and actors to showcase their talent. Local actors will perform the staged script-in-hand readings of six one-act plays selected for performance at the library. PlayFest directors are Julie Ellen Prusinowski, Mary Ann Wylie and Tim Moran. For more information about the One-Act PlayFest please call 609-883-8291 or email Branch Manager James Damron at jdamron@mcl.org. The Lawrence Headquarters Branch is located at 2751 Brunswick Pike (Route 1), Lawrenceville, New Jersey, 08648. 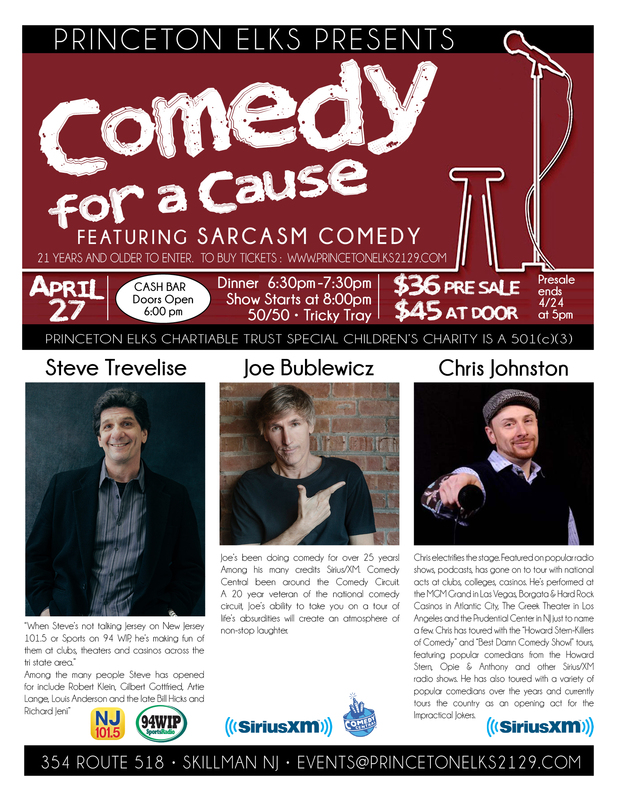 Comedy for a Cause featuring Sarcasm Comedy, Princeton Elks, 6:30pm Dinner/Cash Bar, 8pm, Comedy Show. The Princeton Singers and special guests Princeton Girlchoir perform music by women who have changed the musical landscape. Works of Kassia, Hildegard von Bingen, Anne Boleyn, Fanny Hensel-Mendelssohn, Ruth Crawford Seeger, Sarah Hopkins, Lydia Adams, Reena Esmail, Rosephanye Powell, Ysaye Barnwell, Bettina Sheppard and more.